Cover Your Eyes - Congressman Rohrabacher Wants Iraq to Repay US for Our Nutsy and Klutzy Iraq Invasion & Reconstruction! Image by Gage Skidmore via FlickrDo you know who held a gun to our heads to invade Iraq? The Iraqis! Do you know who forced us to do reconstruction in the billions over there? The Iraqis, who else?! The simplistic way of looking at this is -- we went into the Iraqi Barn, trashed it, paid for it and dear god, we are still paying for it! After eight years of this -- logic dictates that the Iraqis should now pay for it. And that's exactly what one of our long-term elected reps is talking about, during a visit over there, no less. 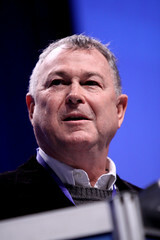 Rep. Dana Rohrabacher, 12th term Republican congressman from California's scenic 46th District and Chairman of the Subcommittee on Oversight and Investigations of the House Foreign Affairs Committee - wants the Iraqi Barn to repay the US Treasury for the mega-dollars the US spent on our nutsy and klutzy invasion and reconstruction of that poor country. We liberated them remember? And turned them into a democracy, did we not? So isn't it only fair that we should get some sort of repayment for that? Hold on to your brains, this is going to be a rough ride! A US congressman called on Friday for Iraq to repay a portion of the "mega-dollars" that Washington has spent since the overthrow of Saddam Hussein in 2003, at a news conference in Baghdad. "Once Iraq becomes a very rich and prosperous country... we would hope that some consideration be given to repaying the United States some of the mega-dollars that we have spent here in the last eight years," Rohrabacher told journalists at the US embassy in Baghdad. "We were hoping that there would be a consideration of a payback because the United States right now is in close to a very serious economic crisis and we could certainly use some people to care about our situation as we have cared about theirs." He said he raised the issue in a meeting with Prime Minister Nuri al-Maliki. Rohrabacher, a member of the Foreign Affairs Committee in the US House of Representatives, declined to give specifics on how much should be paid back, or over what timeframe. Yawrg! Heeeeelp! I just lost my brain ....! Mr. Rohrabacher had previously announced that he plans to hold a hearing to investigate the April 8th massacre of Iranian civilians at Camp Ashraf in Eastern Iraq and "what role the U.S. State Department may have played in a cover up of the crime." Of course, while he's at it, investigating the "cover-up" that is, he must have also thought why not kill two birds with one big rock and deliver the" repay us for invading you" collection receipt. Why, it's the most thoughtful thing to do, I don't know why no one thought of this before. If you'll excuse me, I need to go and put a brown bag over my head now.